So, as I mentioned, I’m in two different Oz-themed clubs at the moment. The WoolGirl one I showed you yesterday – that one is all sock-centric. The Fresh from the Cauldron club isn’t strictly socks – we’re getting two hanks of yarn each month, with a pattern for one of them. They are in different weights, too, which is nice. There may be a full-on project using the secondary skeins, if I can come up with a plan. This was the first shipment, from April. 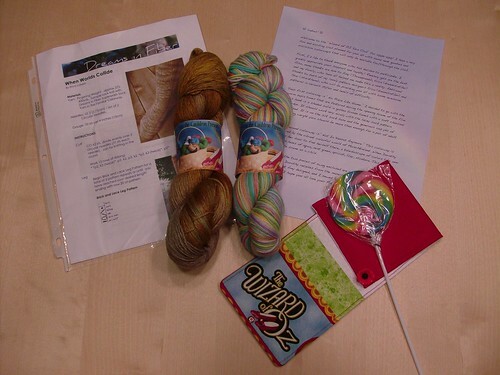 This shipment did have a sock theme – two hanks of sock yarn, and a very cute sock pattern, plus a circular needle case (And how much do I love the poppy button on there!) The yarn on the left is FftC Silk Sock (70% merino, 30% silk) in “No Place Like Home”, which Jen dyed in a color inspired by the sepia-tones at the beginning and end of the movie. It’s really beautiful. The yarn on the right is FftC MCN Sock (80% merino, 10% cashmere, 10% nylon) in “Not in Kansas Anymore” – a lovely pastel rainbow. Here is May’s shipment, which arrived last week. This was a non-sock package. The pattern is for Dorothy’s Basket – a shawl designed by Star Athena, inspired by the idea that our farm girl heroine would need something to keep herself warm when going to the market. The yarn sitting on it is FftC MCN Lace (80% merino 10% cashmere 10% nylon) in “Dorothy Gail”. I love the “If I only had a brain” mug, which goes beautifully with the FftC MCN Worsted in (of course) “Scarecrow”. I think she captured his colors perfectly. 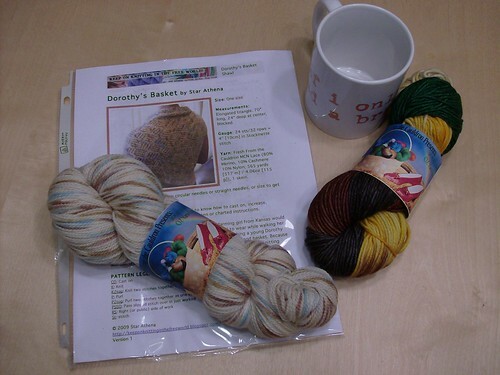 June 4th, 2009 | Tags: Fresh from the Cauldron, Oz Yarn Club | Category: Misc. I *adore* “not in kansas anymore” so so so so so pretty! Ooh, both clubs are way cool. The sepia toned yarn is perfect, though. Cleverest yarn I’ve seen in a club. Star Athena again…huh. I just got my Spin Off mag yesterday where her Knitty Quant was the variety piece of the issue. Cosmic man. I love the color of that lace weight! Scarecrow is my favorite of this bunch, but nothing beats that Zen String from the other day. Wow! Whew, thank goodness her Etsy store is on hiatus. ‘Cause when someone says a yarn is squishy, I have like, no willpower. Hehe..that Weez! Awesome yarn club! I like how she’s doing the different weights and the extras are cool! See, I was thinking of the other Oz! Not surprising, eh? Great “installments” — nothing like a good sock club to brighten the day.